No matter where you live-the East Coast, West Coast or even what Midwesterners have dubbed the “North Coast” with America’s Great Lakes-summer’s sunniest days beg for a weekend (or more!) at the beach. 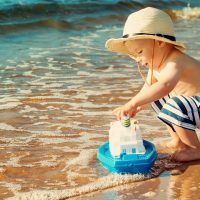 If you want to skip the crowds and higher expenses of well-known beach destinations, we have plenty of under-the-radar places perfect for reconnecting and making summer memories with cooling waves, sand to sculpt and breezes to savor. Here, eight underrated beach towns you’ve probably never heard of — but need to put on your travel list now. 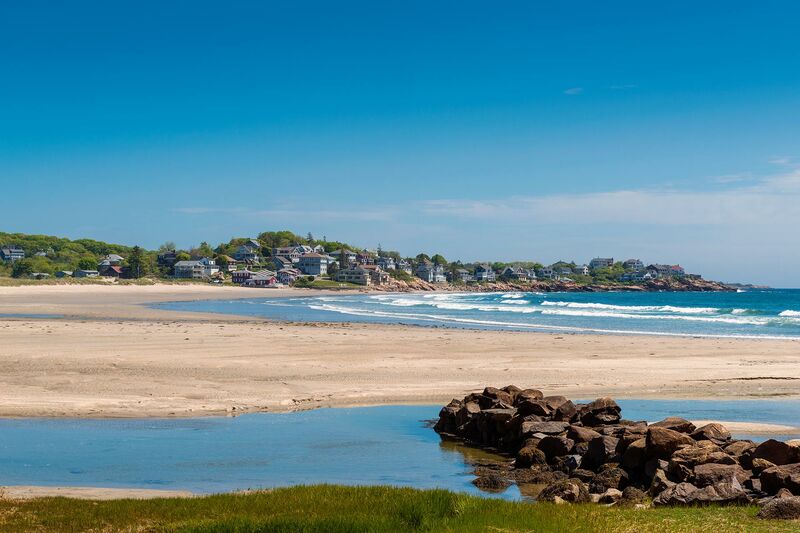 About 40 miles north of Boston, Cape Ann‘s coastal beaches and cuisine provide a picturesque alternative to Cape Cod. Gloucester (pop. 128,000) anchors Cape Ann’s 58-square-mile area, which also includes Rockport, Essex and Manchester-by-the-Sea. Wingaersheek Beach’s rounded rocks offer places to climb and sunbathe while sheltering smaller pools for swimming. Six other beaches provide more to explore in Gloucester, while whale-watching cruises get families onto the Atlantic from mid-April through October. Enjoy crab cakes and lobster omelets for breakfast at Sugar Magnolias (“Sugar Mags”), bouillabaisse and fresh catches at Lobsta Land, and fried clams at Woodman’s of Essex, which is famed for inventing them. Gloucester’s waterfront Fisherman’s Memorial Monument offers a touching tribute to those lost at sea, including the crew of the Andrea Gail, immortalized in “The Perfect Storm” book and movie. Follow the Sea Island Parkway 16 miles southeast of Beaufort’s historic and charming downtown to reach barrier islands and the 5,000-acre Hunting Island State Park. From the top of the 136-foot lighthouse, a bird’s-eye view sweeps across 5 miles of beach. 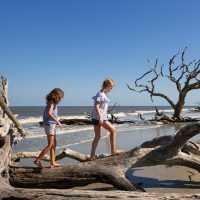 Watch for dolphins in the warm Atlantic waters, gaze at the marsh and inland lagoons or visit the nature center that make this South Carolina’s most popular state park. To truly kick back and enjoy the nature, stay at one of the 100 campsites. African-American history enriches the barrier islands, particularly the Gullah culture with its West African roots. Look for eateries along the Sea Island Parkway, and don’t let humble appearances of places (such as the Shrimp Shack) discourage you. You can find fresh-from-the-boat shrimp and crab, combinations of Low Country and soul food for side dishes, and cool off with iced sweet tea. 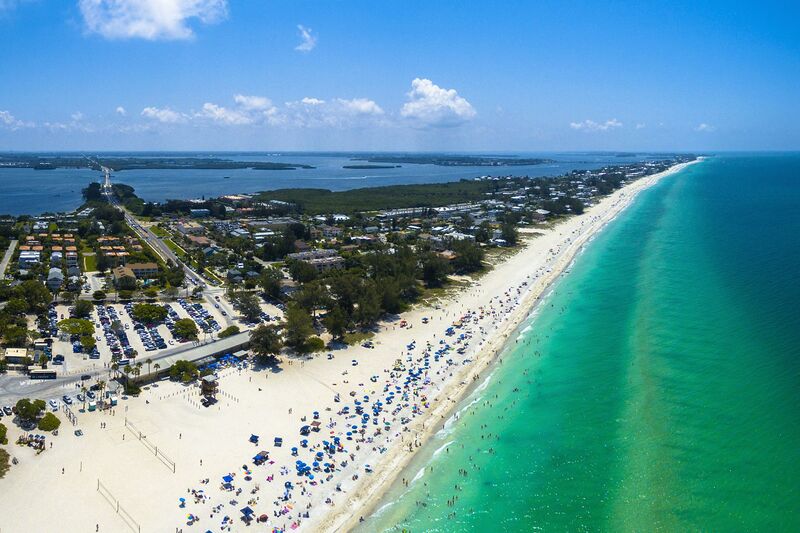 For gentle currents, beautiful sand and tropical blue-green water, head to Anna Maria Island along Florida’s Gulf of Mexico, reached via Bradenton. Expansive Coquina Beach beckons families with picnic tables beneath Australian pines and big stretches of sugary sand. 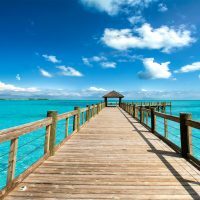 You can head to one of the island’s restaurants, such as the Island Creperie or the Longbeach Caf?, on nearby Longboat Key if you work up an appetite. If you head inland to Bradenton, don’t miss the South Florida Museum for natural history lessons and the River Walk with modern play areas and a top-notch skatepark along the Manatee River. You can’t go wrong with the sandy shores and Caribbean blues all along Lake Michigan’s eastern coast, but Holland offers the additional charm of-you guessed it-Dutch heritage. Tour Windmill Island with an authentic working Dutch windmill, a carousel, and boutiques filled with imports or locally made Delftware and wooden shoes. Stop by the DeBoer Bakkerij for spiced windmill cookies and hugely popular breakfasts and lunches. Then settle in at Holland State Park, which bustles with families thanks to more than 300 campsites divided between Lake Michigan and Lake Macatawa, each campground within 50 feet of sugar-sand shorelines. The park rents kayaks, canoes and stand-up paddleboards for the inland lake, which is perfect for adventurous teens and first-timers. Snap photos with the iconic red lighthouse or colorful sailboats and enjoy spectacular sunsets. For a healthy treat, stop by Bowerman’s U-pick farm or fruit with Michigan’s famed blueberries. On the 70-mile-long Door County Peninsula jutting into Lake Michigan, you’ll find 300 miles of shoreline, dozens of beaches, five state parks and a handful of lighthouses. If you’re looking for great sand and the glory of freshwater, head from Sturgeon Bay toward Jacksonport to reach Whitefish Dunes State Park. In addition to the beautiful beach, you’ll find hiking trails and lessons on the area’s long-ago indigenous settlement. Head just north of Whitefish Dunes to hear the waves gurgle and glug through Cave Point County Park. Craving a campground? Peninsula State Park (about 15 miles away) has them. After beach time, look for Insta-worthy trips to The Farm in Door County, cherry orchards and creameries that make fresh ice cream and squeaky-good cheese curds. Tucked a little inland on the Siuslaw River, this town of about 8,800 people sits near several coastal attractions, including the otherworldly Oregon Dunes National Recreation Area for adrenaline-pumping dune rides (or even sand-boarding!) and Sea Lion Caves, where acoustics amplify the playful barking and antics of Steller sea lions in America’s largest sea cavern. 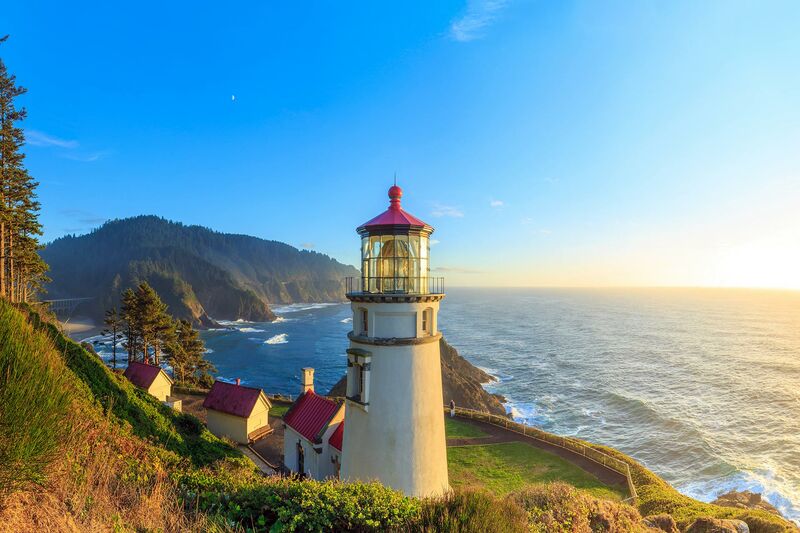 Take binoculars to trails around postcard-perfect Heceta Head Lighthouse to look for migrating whales and seabirds and visit at low tide for excellent tide-pooling around the rocky cove with green anemones and maroon and orange sea stars. Grab a hazelnut-and-blackberry ice cream cone in Florence’s historic Old Town district, look for seals that swim up the river, and head to South Jetty Beach’s crab dock to admire the seasonal catches and watch for jellyfish pulsing through the water. 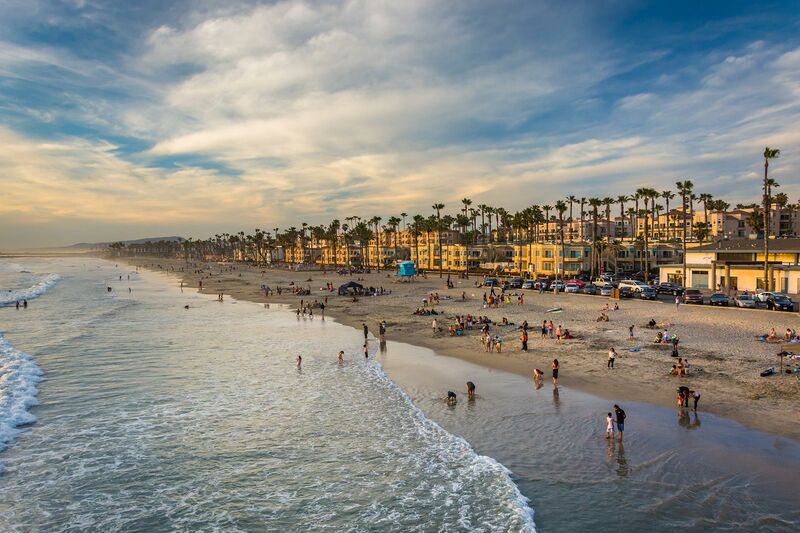 Beaches stretch out beautifully along this laidback surf town, midway between Los Angeles and San Francisco. Wet suits for surfing can be rented from Pismo Beach Surf Shop or you can head to Oceano Dunes with 5 miles of sand “waves” and ATV rides. Explore some of the area’s sea caves, or check on guided hikes, horseback rides or mountain bike treks through the 900-acre Pismo Preserve, a long-awaited coastal area expected to open to the public full time in late 2018. When you’ve worked up an appetite, head to the Splash Caf?, which serves 30,000 gallons of creamy clam chowder a year and encourages art doodling on napkins while you wait. If you visit between October and February, head to the Monarch Butterfly Grove to see the spectacle of eucalyptus trees covered with wintering monarchs or watch the horizon in December and March to spot 23,000 whales that migrate along the coast between Alaska and breeding grounds in Mexico.